Some operation requires our command-line tool to be installed. 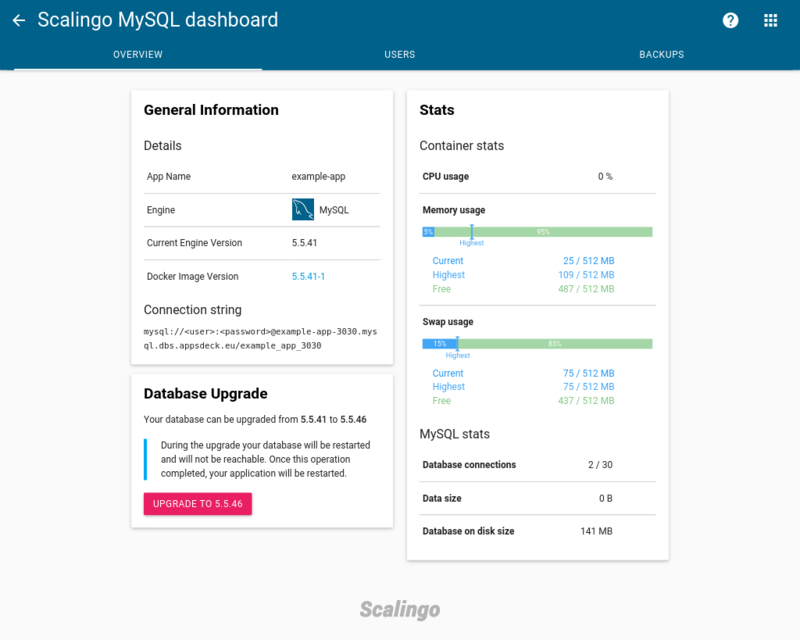 MySQL is the official addon provided by Scalingo, details on the available plans can be found here. This addon gives your app instant access to a MySQL database running in its own Docker container. You can add the MySQL addon through the dashboard or through the command line interface. The capacity of your database is elastic, you will be able to upgrade it later. This command will provision the application my-app with a 1g MySQL database plan. 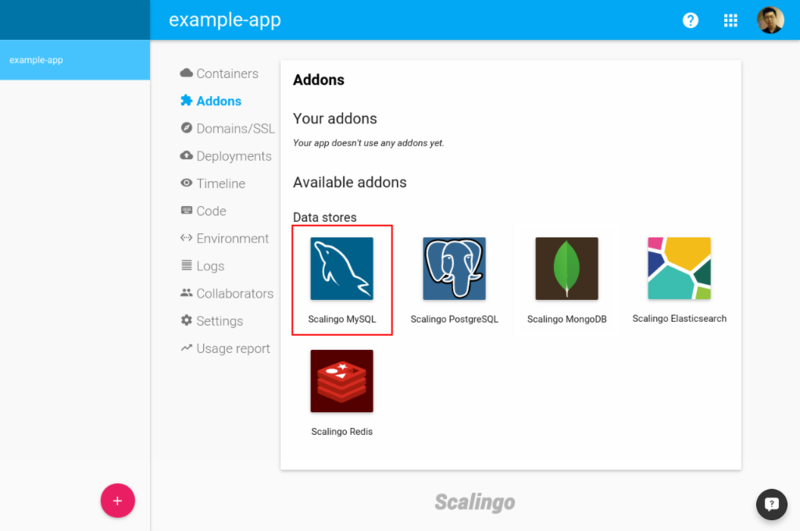 Once the addon is provisioned, 2 environment variables are added to your app: SCALINGO_MYSQL_URL and DATABASE_URL. To find out how to use it in your code please refer to Application environment. In most cases, you can pass the variable directly to the client library you are using in your code. But sometimes the library requires a specific URI format, you’ll need to add a little bit of code to suit the library. You can get environment variables from the dashboard or the command line interface. DATABASE_URL is an alias to SCALINGO_MYSQL_URL, the Ruby buildpack will read the value of DATABASE_URL and create the database.yml configuration file accordingly. If you’re using the mysql2 gem, you will need to copy the value of SCALINGO_MYSQL_URL into DATABASE_URL and change the scheme part from mysql:// to mysql2://. If you need to access your database from other places than your app please follow the Access your database guide. MySQL support TLS to encrypt all of its network traffic between the client and the server. Some existing databases may not have yet TLS support. To activate TLS, you need to restart the database. Any action leading to the restart will activate TLS (e.g. plan update, upgrade of the database). TLS is an option, you can still access your database without it if needed. Note that you must have configured your application to use TLS when connecting to the database. Some providers like Google Data Studio will require a client certificate when TLS is enabled. In this case, contact us via the in app chat or via email at support@scalingo.com. You can upgrade or downgrade your database plan whenever you need it. This operation happens instantly thanks to Docker containers and no manual input is required. When you change the plan, your database will be stopped then restarted on a new host with new parameters of the chosen plan. During the operation the connection is dropped between your app and the database. Finally, after the operation is successful, the related app will be restarted. To upgrade or downgrade your addon the sub-command is the same: addons-upgrade. In this example, my-app-3030 is the ID of the addon, and 2g is the plan we want to upgrade to. When the database vendor releases a new version of your database engine, we will try to provide it as soon as possible. You will have the choice to upgrade your database with one click through your database dashboard. This operation is similar to changing your database plan; your database will be stopped and restarted with the new database version. When this operation finishes, your application will be restarted. Beware that no downgrade is possible once your database has been upgraded. CPU usage Current CPU usage. Memory usage Display the current, hightest and free memory. Highest is the maximum memory recorded since database restarted. Swap usage Display the current, hightest and free swap. Highest is the maximum swap recorded since database restarted. Database connections Number of currently open and maximum connections. Data size Logical space reported by the database. Database on disk size Effective physical space used. Automated backups are listed in the database specific dashboard. 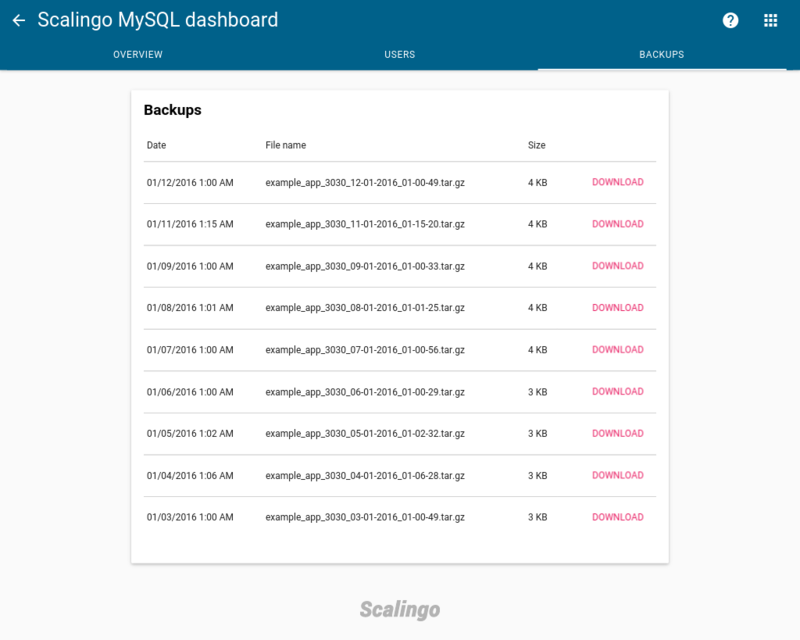 If you wish to manually backup your database, please follow How to dump and restore my MySQL database on Scalingo guide. All databases created after the 6th of January 2019 have encryption at rest enabled. In other words, all your data are encrypted before being stored on disk. For databases created before this date, encryption at rest is activable on-demand through the support. Activating it is achieved with a short downtime for your database, from seconds to minutes depending on the amount of data. A phpMyAdmin instance is available at https://phpmyadmin.scalingo.io. 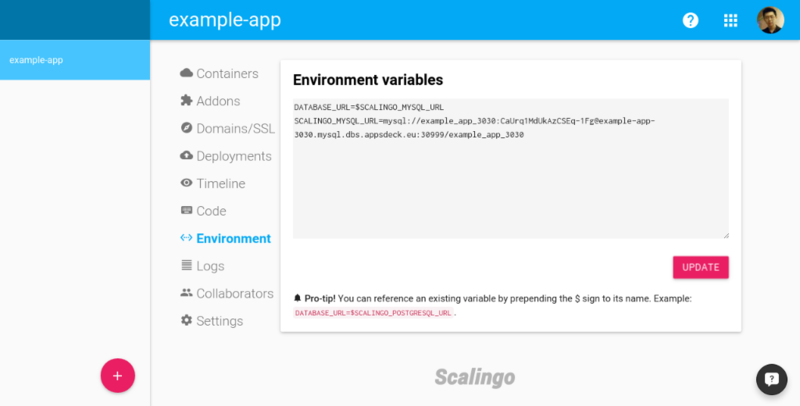 The server, username and password fields must be filled with the information in your SCALINGO_MYSQL_URL environment variable. Note that the server input should be in the form host:port. An Adminer instance is available at https://adminer.scalingo.com. The server, username, password and database fields must be filled with the information in your SCALINGO_MYSQL_URL environment variable. Note that the server input should be in the form host:port.